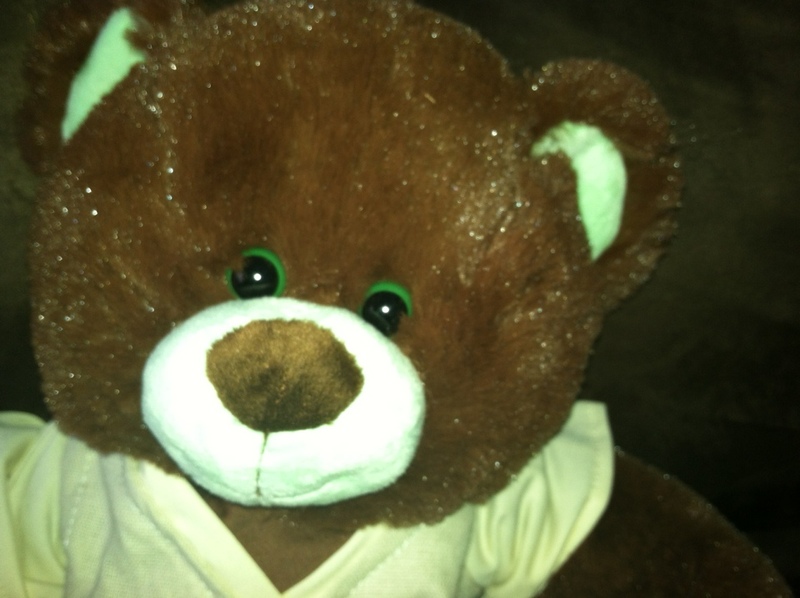 MamaBreak: Build a Bear Review AND GIVEAWAY!!! We are so excited to share the new bears at Build-A-Bear Workshop with you! We LOVE Build-A- Bear Workshop. Not only do they have quality stuffed animals, but you can personalize each bear to fit your child's personality. We think they are the perfect way to say "I Love You" for your little ones this Valentine's Day! The adorable pink Disney Princess Bear (click here to see a review-- and another giveaway)! Complete with a crown. They have a TON of accessories including princess dresses, shoes, and even princess HAIR!!! The, oh so cute, Harajuku Hugs Panda. Look at those adorable eyes! This bear was just introduced to the Build-A-Bear Workshop website on January 18th! Last, but not least, the Girl Scouts Thin Mint Bear! This bear will not be available until February 2nd, and you will want to be SURE to get one. Remember how I said you could personalize each bear to YOUR child's interests? 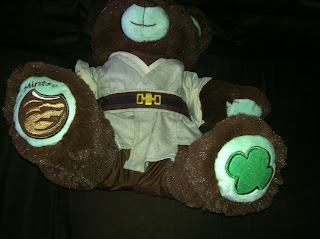 Well, we are thrilled to share with you OUR Girl Scouts Thin Mint Jedi Bear! 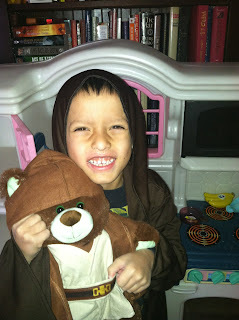 and a Padawan cloak-- which of course my son had to put on right away when he saw his new bear. And of course, the Girl Scouts Thin Mint feet! The best part about this bear is that it is very gender neutral. If you have a young lady in your life who is a Girl Scout, I could not think of a more perfect gift! 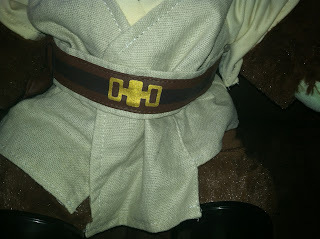 If you have a Jedi in your house, it is the perfect gift as well. Each bear can be dressed up and designed to match YOUR child, and we think that is incredibly special! Want to make your own bear at Build-A-Bear Workshop? Enter below for a $25 Bear Buck Gift Card! Build-A-Bear Workshop provided MamaBreak with a bear to review here on the website. MamaBreak did not receive any other type of compensation. As always our opinions and experiences are our own. Love the thin mints bear! Too cute! I love the thin mint bear! 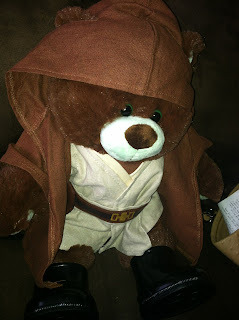 I live the Luke Sky-walker Bear! thin mints bear but my son would want the panda i think! Daughter wants the princess bear since receiving the flyer at the beginning of the month. Already got the new light up bear. The Panda and Princesses both my girls would love! They are expanding so much and we love it!! Definitely the Harajuku Hugs Panda! I like the girl scouts thin mint's cookie bear- because I was a girl scout & I love thin mint cookies! I like the pink Disney Princess Bear best! I love the Haraku bear! I like the Cinderella Princess bear. I love the Jedi bear! I like the Haraiuku Hugs Panda. Those eyes are so cute. Oh wow, I need a Jedi Bear!!! Star Wars bears are awesome! Love the Luke Skywalker bear! Aweee the Disney princess one is adorable!!!!! Disney Princess Bear!! SOO Cute! I like the thin mint bear. Like the Disney Princess Bear. I love the Harajuku Hugs Panda. His eyes are so cute. Disney Princess but I love your Jedi, lol. I love the New Disney Princess Bears! I like the girl scouts thin mint bear. I like the thin mints bear, and I love the way you dressed him! I like the Disney Princess bear. thank you! The Jedi bear is so amazing!!! I love the Harajuku Panda & the Disney Princess Bears. Thank you! the panda is my fav. I love the rapunzel bear! I like the GS Thin Mint Bear! I like the Harajuku Hugs Panda. The Disney Princess because I have a bunch of little Princess' that it reminds me of. Love the Thin Mint Bear, because it's Girl Scout Cookie Season! My favorite is the Thin Mint Bear. I love their new Vanilla Cream Bunny in Snow White Costume! I like the pink Disney princess bear. Thanks for hosting! I love the Harajuku Hugs Panda. Thanks for the chance! I like the Thin Mint Bear and the lucky shamrock on his foot. My grandson who is 9 months old would love to have a bear to snuggle.